Three rules I live by: 1.) Frequent trips to the greenmarket. 2.) Keep your kitchen basics stocked. 3.) Let whatever you have on hand inspire your cooking. Rule no. 1 sets you up for success: If you always have some variation of locally grown, seasonal produce on hand, you’ve got a great basis for inspiration. Rule no. 2 helps with time management: You won’t have to drop everything to run to the store for one or two items, wasting 30 minutes or more. Rule no. 3 is easy — when you follow no. 1 and no. 2. Hence this gorgeous salad, which I pulled together based on what I had on hand. Add-ons: Protein of your choice — we have wild caught single serve portions of Mahi Mahi from Costco in our freezer. Slivered almonds or cheese would also be delicious additions in the absence of fish. Also, I threw in some leftover pickled onion that I had in the fridge. Directions: Toss the fennel, apple and garlic cloves in EVOO, salt and pepper, and roast at 400 degrees for about 20 minutes, turning once or twice, until lightly browned. Add the raisins for the last 5 minutes. Separate the fennel and raisins; set aside. Chop the roasted apple slices and slice the garlic thinly; reserve. Separately, heat 1T EVOO and 1T butter (optional — but recommended) in a large saute pan. Add mushrooms and rosemary and cook over medium heat, stirring frequently. Add the reserved apple and garlic. 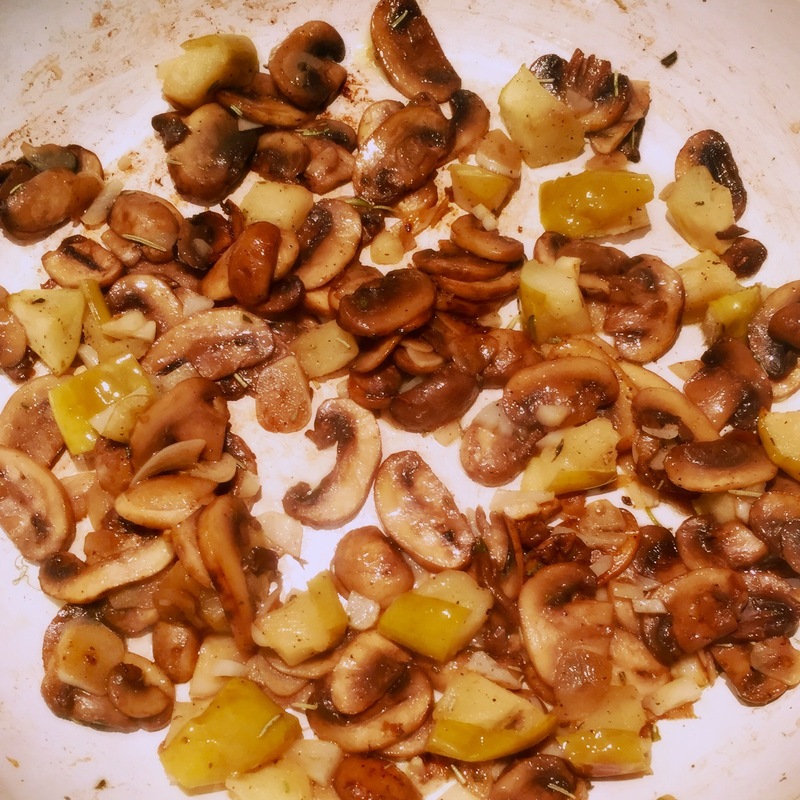 Once the mushrooms are cooked and the liquid has evaporated, add 1T sherry vinegar around the edge of the pan (red wine vinegar or even apple cider vinegar would also work) and stir to incorporate. Continue cooking another five minutes or so, until all of the liquid has evaporated. Toss greens in drizzle of EVOO and white balsamic vinegar (regular balsamic vinegar would work as well — white balsamic has a lighter, lightly sweet taste). Salt and pepper lightly. 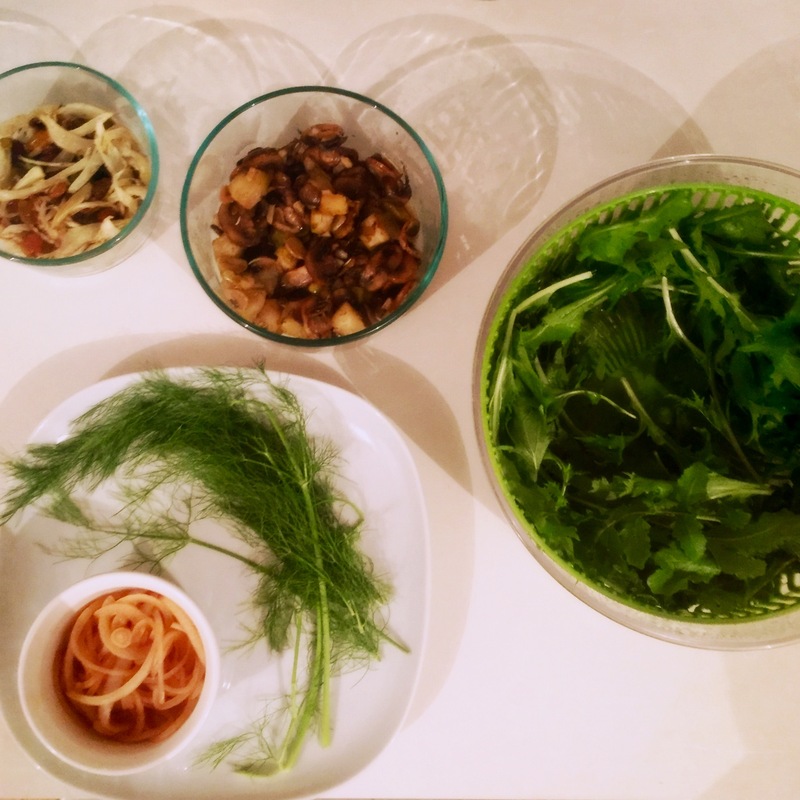 To plate: Divide salad onto two plates and top with some of the reserved fennel fronds — just a few pieces here and there. Spoon mushroom mixture over salad and gently mix. Add a few more fennel fronds if desired. 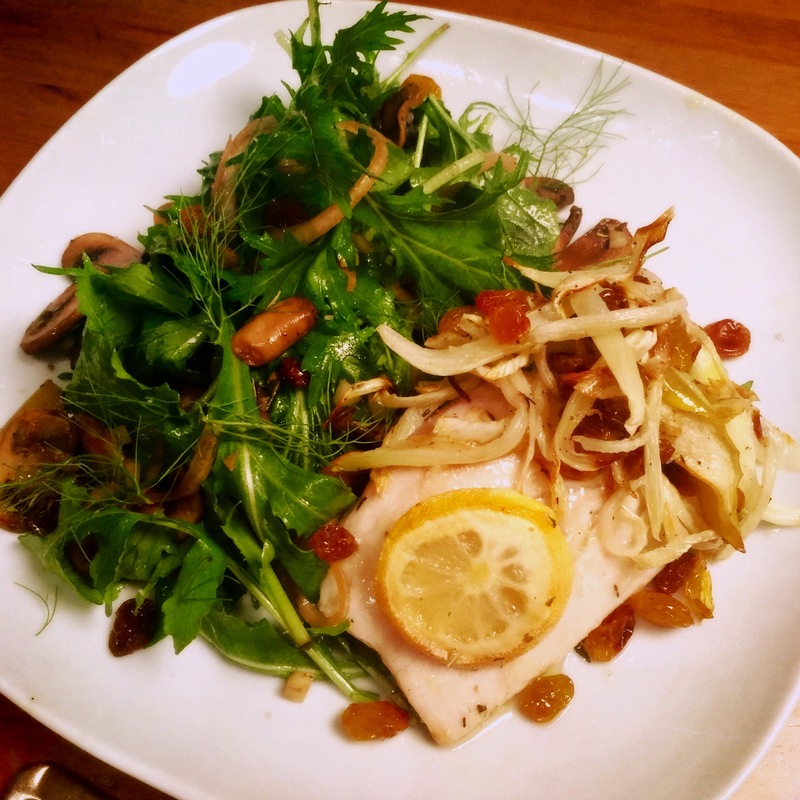 Top with roasted fennel and raisins.